Better is a dry morsel with quiet than a house full of feasting with strife.A perverse person spreads strife, and a whisperer separates close friends.Go to the ant, you lazybones; consider its ways, and be wise. Everyday we make choices on the path of life. Proverbs are memorable capsules of wisdom, chiseled in words and polished through use by those who have traveled that path ahead of us. But the proverbs of the Bible make a greater claim than "a penny saved is a penny earned." They are woven into the web of divine revelation, rooted in the "fear of the Lord" that is the beginning of wisdom. While many proverbs speak to us directly, we can gain much greater insight by studying the book of Proverbs as a whole, understanding its relationship to ancient non-Israelite wisdom and listening to its conversation with the other great voices of wisdom in Scripture--Job and Ecclesiastes. 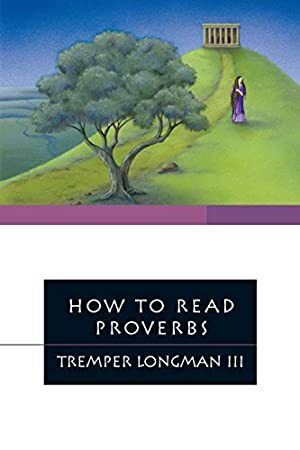 In How to Read Proverbs Tremper Longman III provides a welcome guide to reading and studying, understanding and savoring the Proverbs for all their wisdom. Most important for Christian readers, we gain insight into how Christ is the climax and embodiment of wisdom. Track It. This book has been $9.78 within the past year. Log In to track Tremper Longman III on eReaderIQ. to be notified each time the price drops on any book by Tremper Longman III. to stop tracking Tremper Longman III. We started tracking this book on March 2, 2012. This book was $9.94 when we started tracking it. The price of this book has changed 60 times in the past 2,605 days. The current price of this book is $11.49 last checked 10 hours ago. This lowest price this book has been offered at in the past year is $9.78. The lowest price to date was $9.42 last reached on April 18, 2012. This book has been $9.42 one time since we started tracking it. The highest price to date was $12.65 last reached on January 13, 2019. This book has been $12.65 4 times since we started tracking it. We last verified the price of this book about 10 hours ago. At that time, the price was $11.49. This price is subject to change. The price displayed on the Amazon.com website at the time of purchase is the price you will pay for this book. Please confirm the price before making any purchases.